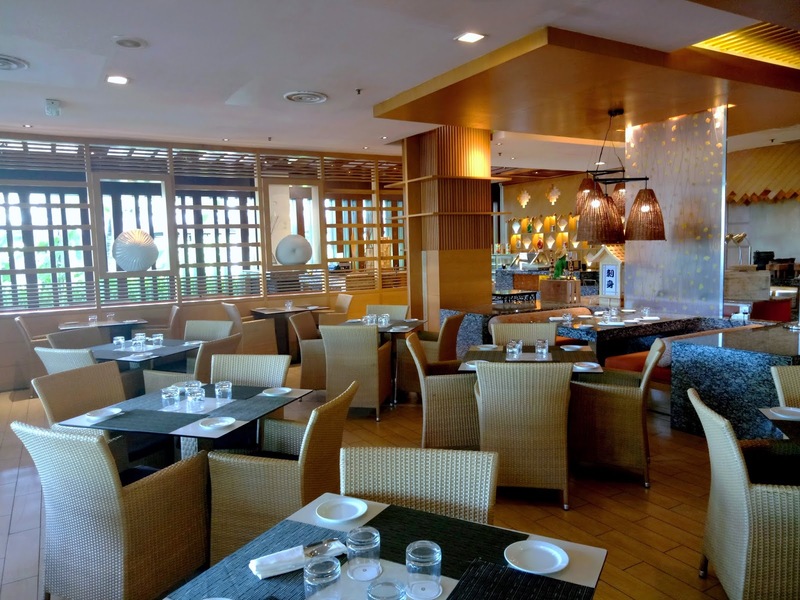 Located at the Garden Wing of Rasa Ria, Coffee Terrace is the resort's all-day dining restaurant. This is also where most in-house guests have breakfast in the morning. The eatery has both air-conditioned and al fresco dining areas. 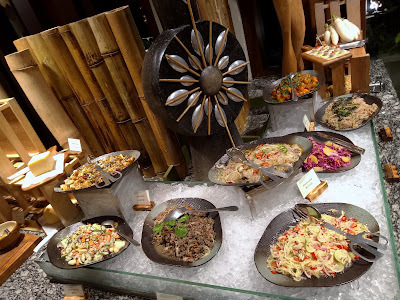 Our visit to Coffee Terrace this evening is to savor the Taste Of Asia Buffet Dinner. As the name implies, the menu primarily consists of Asian-style dishes. 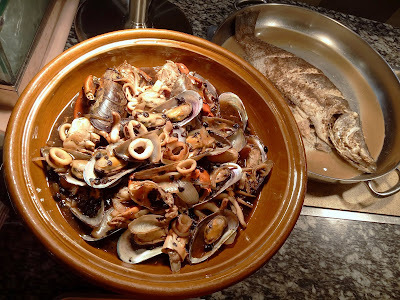 There is also an emphasis on fresh seafood and local Sabahan produce. 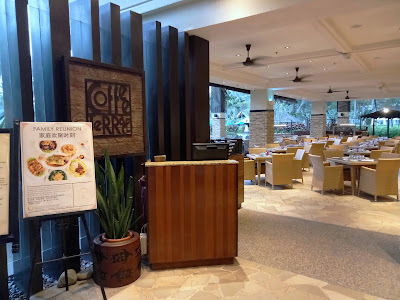 Originally held at Tepi Laut, the buffet is temporarily moved to Coffee Terrace as Tepi Laut is undergoing renovation. Starting with Crabs With Hot Bean Sauce, this stir-fried dish packs a fiery punch within the crabs' scrumptious meat. Another delectable dish, Fish Curry, consists of bite-size fish fillets cooked in a creamy sauce. The curry is mildly spicy by Malaysian standards. 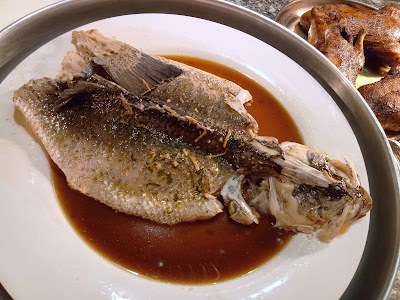 Steamed Whole Fish is another interesting dish. 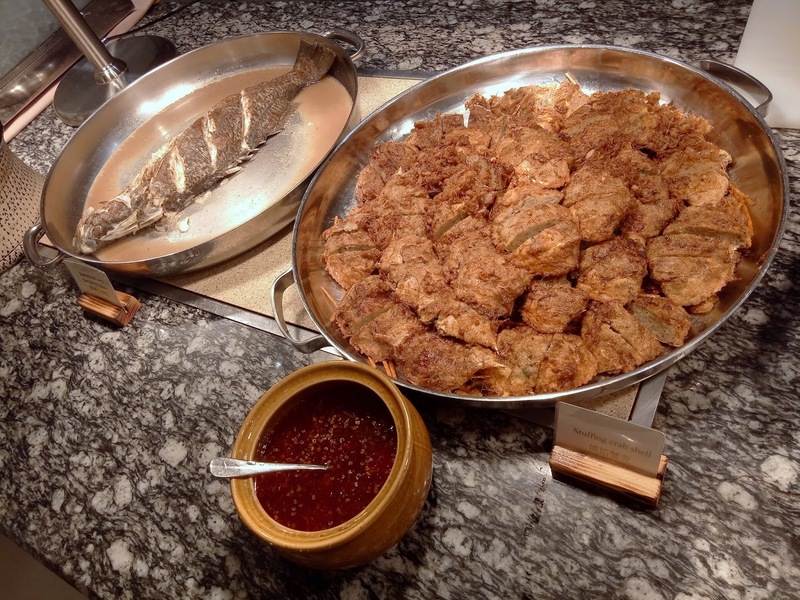 The choice of fish is barramundi, whose firm texture produces a succulent mouthfeel. Light soy sauce serves to accentuate the freshness of fish. Seafood With Fermented Bean Sauce contains an assortment of mussels, squids and crabs. The sauce balances salty and savory flavors in a delicate manner. 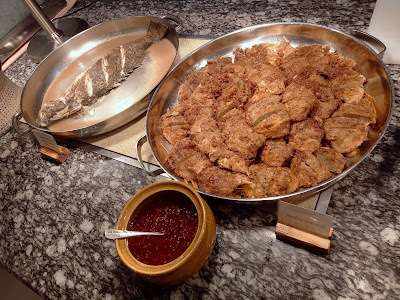 Meanwhile, Baked Fish With Tamarind Sauce relies on the sourness of tamarind to give the fish a sharp taste. 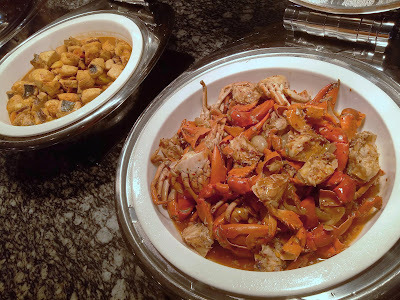 Stuffing Crab Shell is an exquisite delicacy indeed. Crab meat is minced and seasoned, and then returned to the carapaces. The crabs are baked until they turn brown. Sweet chili sauce serves as the condiment. 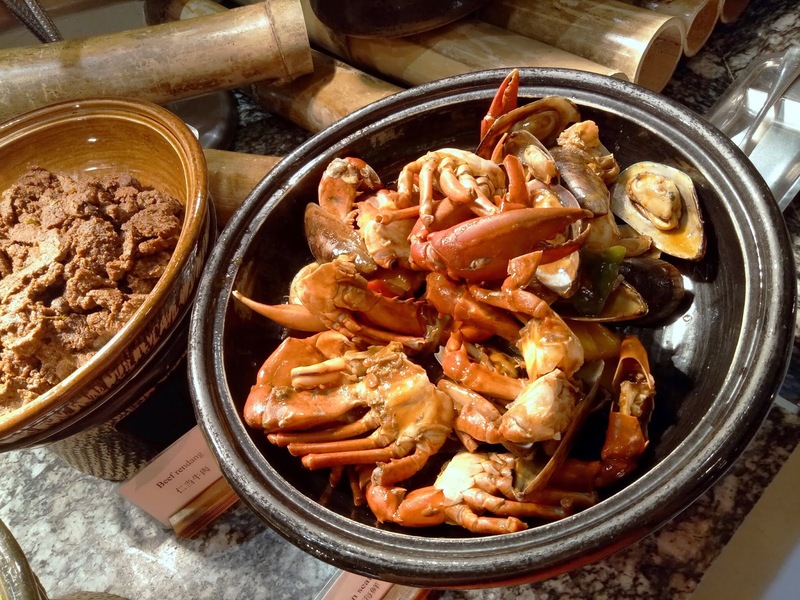 As for Hot Bean Seafood, crabs and mussels are brought together with a touch of spiciness. On the other hand, Beef Rendang goes in the savory direction through liberal use of coconut milk and spices. 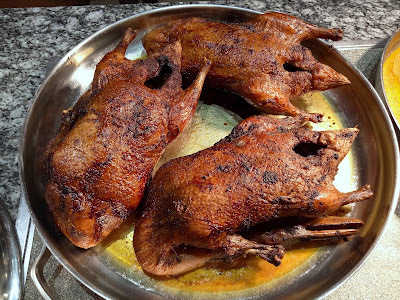 Balinese Duck, known in Bali as "Bebek Betutu", is an immensely popular dish. The duck is seasoned with spices such as ginger, turmeric and chili peppers, and then roasted to golden perfection. The salad counter prepares a wide variety of salads including Minced Beef Salad, Potato Salad, Green Mango Salad, Pomelo Salad and Asian Slaw. Should diners prefer to mix their own salad ingredients, several types of leafy vegetables and dressings are provided. 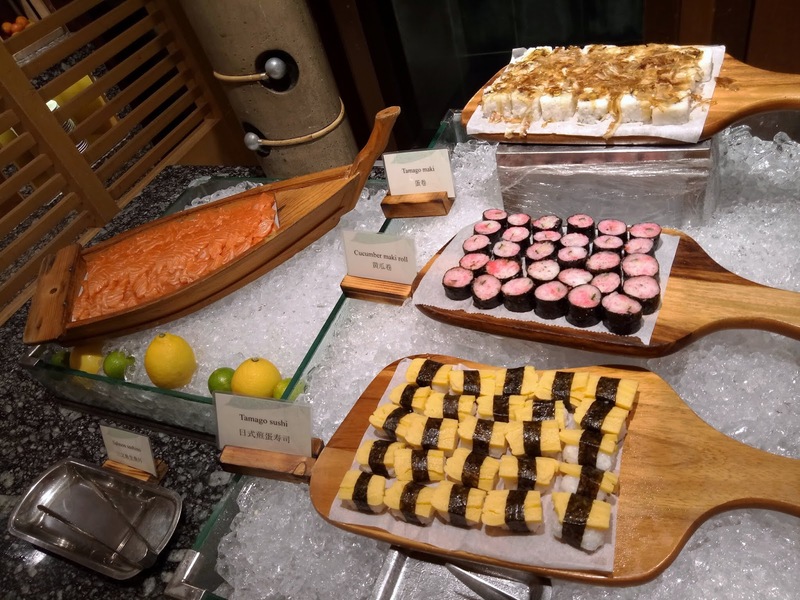 Proceeding to the Japanese section, one finds sushi (寿司) with ingredients like omelette (玉子), fried tofu (稲荷) and pickled daikon (沢庵). As for sashimi (刺身), raw slices of salmon and tuna are prepared. Popular sushi condiments are wasabi (山葵), pickled ginger (ガリ), pickled cucumber (柴漬) and soy sauce (醬油) are provided. Moving on to pastries, the bread area covers Rye Loaf, Green Tea Loaf, French Bread, Bread Rolls and more. Meanwhile, soup choices this evening are Chicken Soup, Vegetables Soup, Tom Yum Soup and Pumpkin Cream Soup. 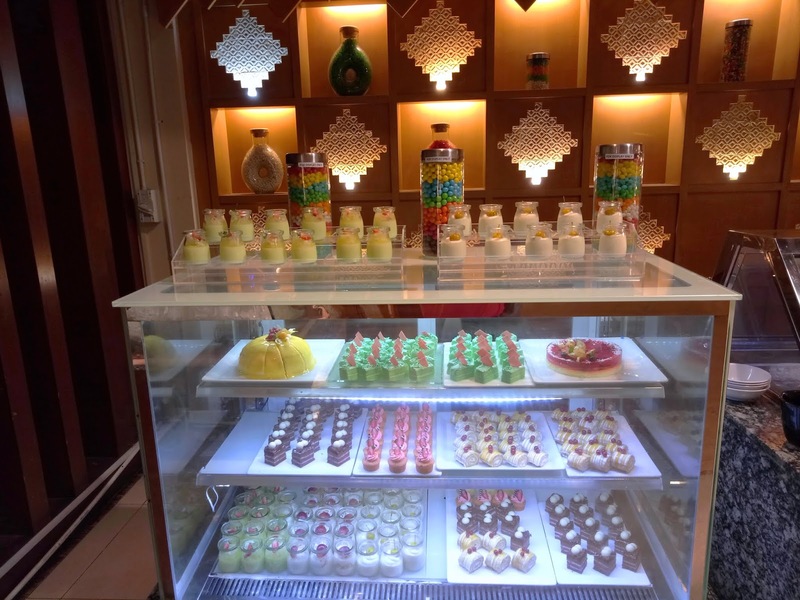 Bakers' confections include Mango Dome Cake, Pandan Cream Cake, Chocolate Cream Cake, Pineapple Strudel, Orange Financier, Kaya Custard Swiss Rolls, Coconut Mousse, Honeydew Pudding, Fruit Jelly Cake and Mint Crème Brûlée. There are also local snacks like Kueh Lapis. 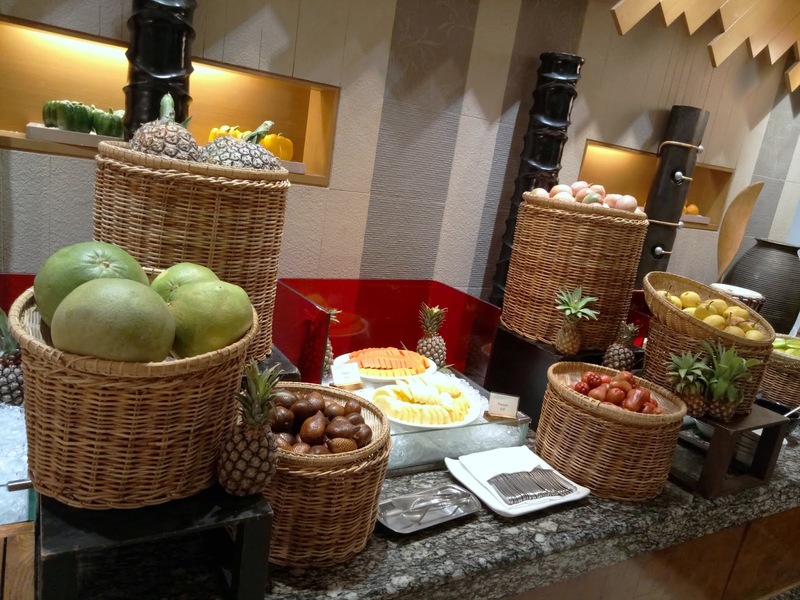 The buffet spread presents a variety of fruits such as salak (snake fruit), belimbing (star fruit), jambu air (rose apple), papaya, pineapple and passion fruit. This section reflects the abundance of fresh fruits here in Sabah. 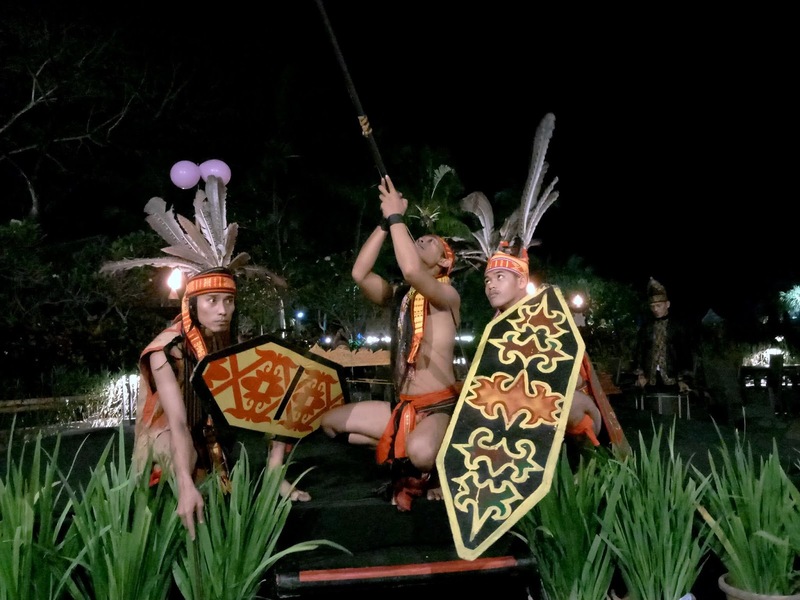 During dinner, diners are entertained by a local dance troupe that presents cultural dances of indigenous Sabahan tribes. Dressed in traditional costumes, the performers take the opportunity to show off their prowess in blowpipe marksmanship. Towards the end of the cultural performance, the dancers also demonstrate a local folk dance called "magunatip", after which diners are welcome to participate. 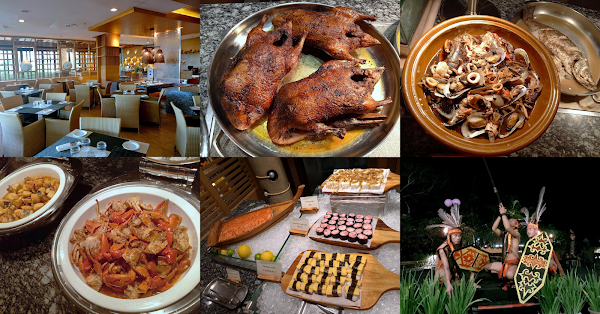 The Taste Of Asia Buffet Dinner is priced at RM168.00 net per person. Children between ages 6 and 11 enjoy 50% discount. 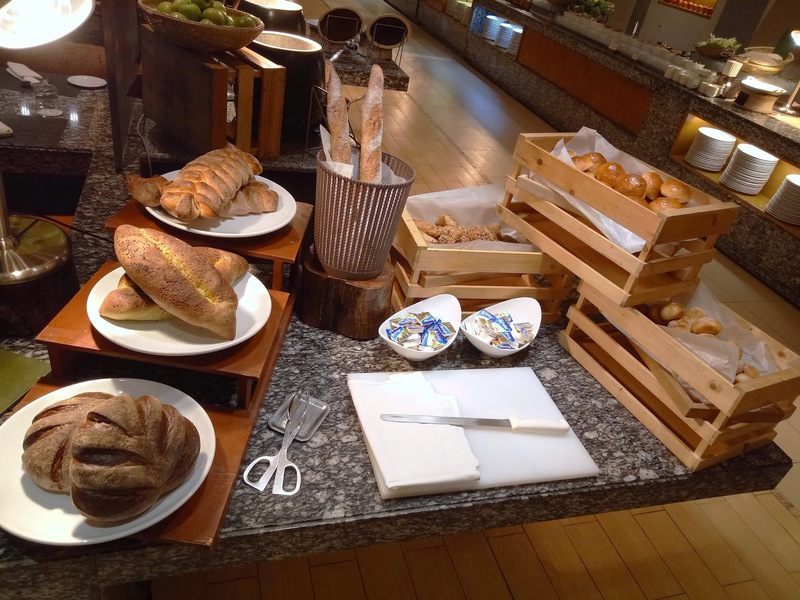 This buffet is served every Saturday from 6:30pm to 10:00pm. On other days of the week, the buffet dinner features different themes such as Mediterranean on Thursdays and Seafood on Fridays. Directions: Driving along the main road from Kota Kinabalu to Kota Belud, turn left to Jalan Norowot near Tuaran. Continue driving for another 11 kilometers until you see the signboard for Rasa Ria. Turn left and drive to the end of the road. 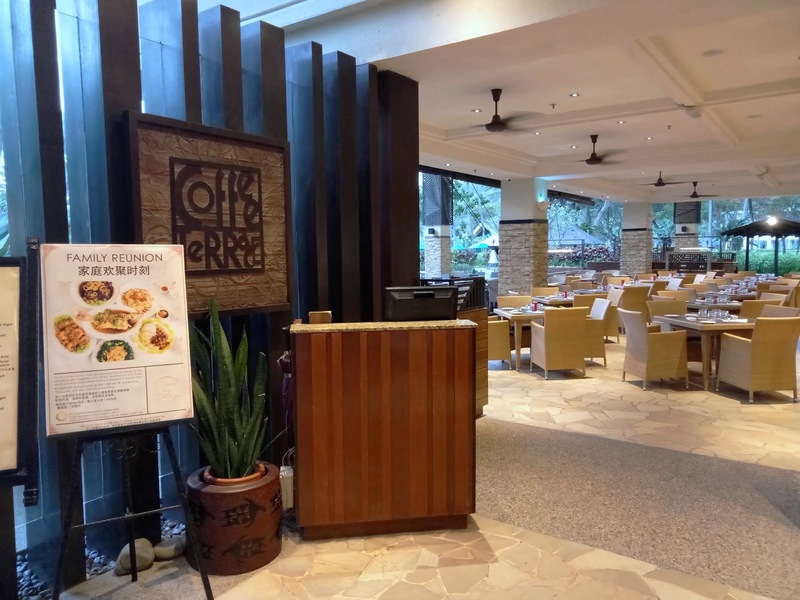 Coffee Terrace is located one floor below the Garden Wing lobby.